Britain’s impact on world history has been staggering—and in this authoritative and sweeping book, Sir Roy Strong chronicles the country’s rich past and its profound influence through the ages. He begins the story with the very earliest recorded Celtic times, and with this new edition brings it up to date via the Blair years and into the present day of Brexit Britain. 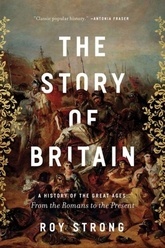 A magnificently eloquent volume, the narrative chronicles two thousand years of Britain’s history, the triumph of its people, the glory of its culture, and its dramatic influence on other nations of the world, especially the United States. It is a remarkable achievement and, with his passion, enthusiasm, and wide-ranging knowledge, Strong is the ideal narrator.